Bulletproof Cold Brew Mocha is cold brewed, ready-to-go Bulletproof coffee with chocolate flavour, C8 MCT oil and grass-fed butter. Contains: 12 bottles of 330 mL. Bulletproof Coffee is a popular recipe from the Bulletproof Lifestyle and also compatible with paleo and ketogenic diets. 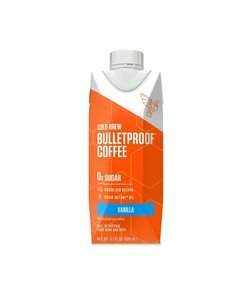 Bulletproof Coffee is made with high-quality beans that have been tested for contamination by 27 fungal toxin types (mycotoxins). Cold brew coffee is made by steeping ground coffee beans in cold water. This method of brewing coffee requires that the coffee steeps for longer (about 12 hours or more). 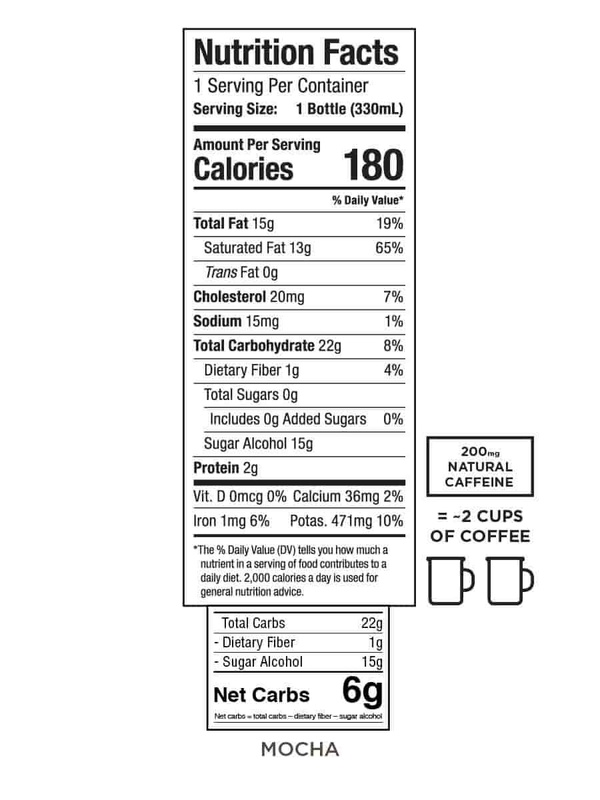 Cold brew coffee contains more caffeine than regular coffee. 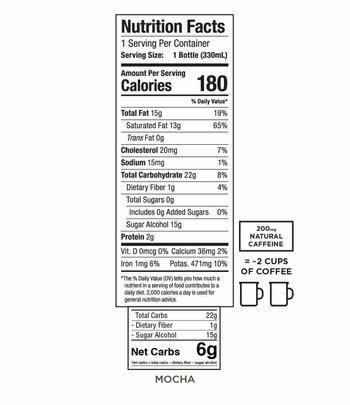 One packet Bulletproof Cold Brew Mocha (330 mL) contains two teaspoons grass-fed butter and two teaspoons C8 MCT oil. These healthy fats provide you with long-term energy. One package Bulletproof Cold Brew Mocha contains 12 bottles of 330 mL each. 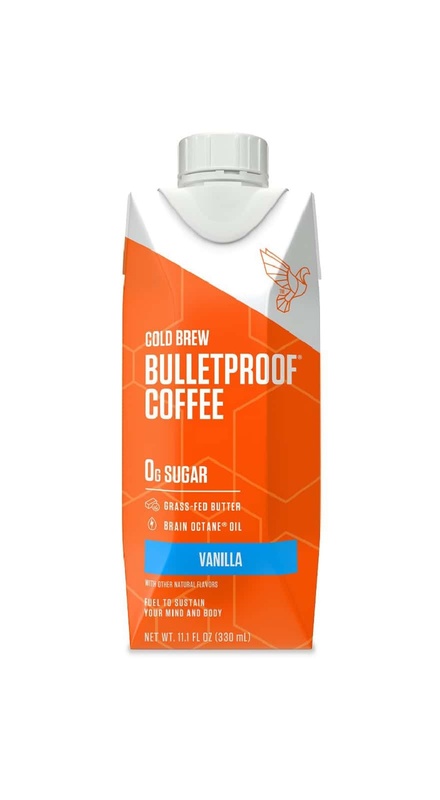 Three different flavours are also available: Bulletproof Cold Brew Vanilla, Bulletproof Cold Brew Collagen, and Bulletproof Cold Brew Original. Bulletproof Cold Brew Mocha is best served cold but doesn't need to be stored refrigerated. 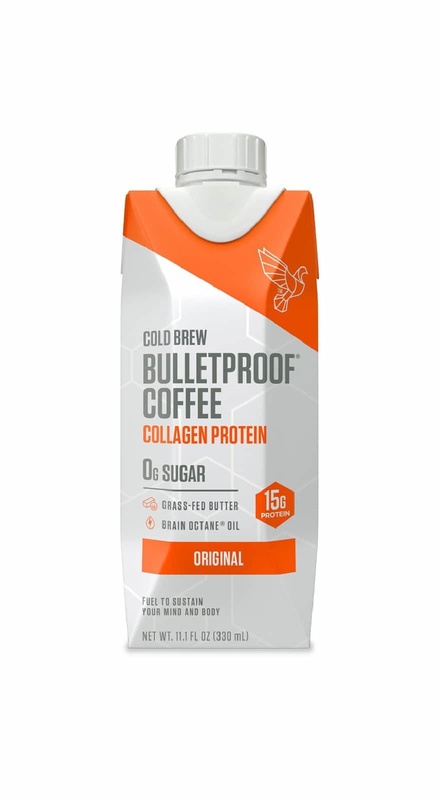 You can drink Bulletproof Cold Brew Mocha coffee straight out of the bottle. Easy to use and convenient for travel, or for when you don't have time to make Bulletproof Coffee yourself. Also great as a chilled beverage on warm summer days! RI = recommended daily reference intake based on a daily intake of 2000 kcal. Ingredients: Coffee (cold brewed), C8 MCT oil (Brain Octane), butter (grass-fed), erythritol and xylitol (natural sweeteners), organic cacao powder and Madagascar vanilla (natural flavours), gum acacia (emulator), gellan gum (emulator), organic quillaja extract, monk fruit extract.